Don Bosco Matunga, is an English medium school run by the Salesians of Don Bosco. This institution meant primarily for Catholics is established and administered by the Catholic Church but it is open to all irrespective of religion, caste or creed. The school is recognised by the Government of Maharashtra. Don Bosco is perceived as a school apart, for it has a fine blend of academics, sports and culture. Considering the numerous activities that take place all the year round one wonders when the teaching and learning is done. Well, the secret is precise pre-planning with perfect execution and behold, you have a NEAT job done in every arena. A true testament to this claim are the innumerable laurels won by the students in every field. 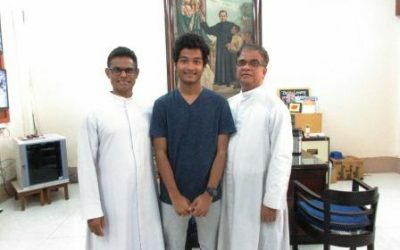 Don Bosco sends up on an average over three hundred students and secures a nearly cent percent result. This in itself speaks volumes about the overall academic performance of the school. Each standard has its syllabus meticulously charted in the syllabus book which also contains formats of the Test/Exam papers along with the distribution of marks. Every child is given this book at the beginning of each academic year. This enables the teachers to efficiently execute the syllabus and aids the parents to follow the work systematically done in school. Master Karsten D’Souza shortlisted for football trials for National team 2019.